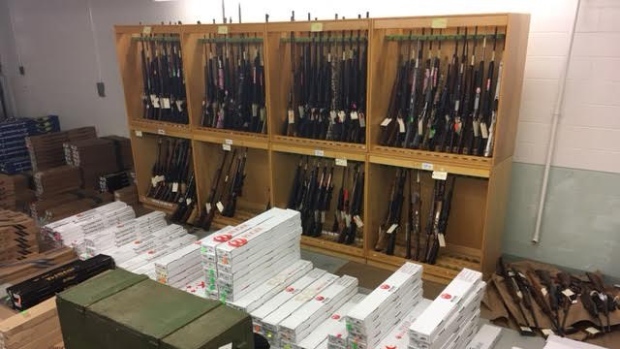 A store in Southern Alberta has had over 1 million rounds of ammo, 49 handguns, 972 long guns,446 kilograms of Tannerite,(an explosive material) 12,000 firearm primers and 270 kilograms of gunpowder seized from a Cardston gun shop. The investigation is apparently being done by ALERT. The investigators are claiming that illegal weapons and ammunition had been sold on more than one occasion. “At this time we don’t have any idea of any crimes that have occurred as a result of these firearms that possibly could have been sold illegally but certainly, without a doubt, it is a grave possibility,” said S/Sgt Jason Walper. The investigation has lasted a total of five months and in the search warrant on may 29, the entire gun shop's supply of firearms was taken. “This gun store needlessly put public safety at risk by allowing conceivably anyone to acquire guns. We would be naïve to believe that this was not exploited by organized crime and the criminal element,” said ALERT Lethbridge Staff Sgt. Jason Walper. Both 58-year-old Dean Sommerfeldt and 31-year-old Todd Sommerfeldt are both charged with the crime of trafficking a firearm, careless storage of a restricted weapon and transfer of a weapon or ammunition without authority, and of course the crime of possession of weapons for the purpose of trafficking. However, both of these men are currently released from police custody with conditions.